Today we did a very fun activity with all the classes in our pod to learn about non standard measurement. 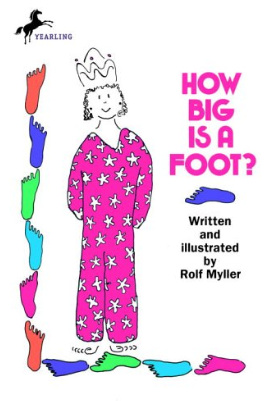 Mrs. Wideen read the book, "How Big Is A Foot?". The book was about how the King wants to give the Queen something special for her birthday. The Queen has everything, except a bed. The trouble is that no one in the Kingdom knows the answer to a very important question: How Big is a Bed? because beds at the time had not yet been invented. The king decided to measure the queen by using his feet. He told her to lay on the floor and measured her by how many feet wide and how many feet long she was. We learned that the bed that was made was too small for the king because the carpenter that made the bed had much smaller feet. We tested this theory by measuring out our teacher's feet and making a pretend bed on the floor and measuring out a bed using some of our friends feet. What an engaging way to introduce the concept of measurement. It looks like so much fun! I definitely want to read that book to my class. We just finished our measurement unit. What will you measure next? Thanks for sharing! I never read theat book it sounds like so much fun. The activity lookes so much fun. I would love to lay down on the floor and roll.